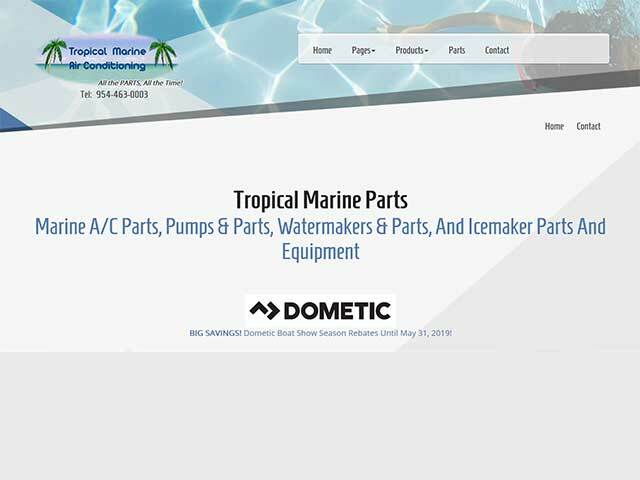 Tropical Marine Air Conditioning, Inc. is a 30+ year old company in Fort Lauderdale, Florida dedicated to superior service and marine parts supply. Air Conditioning, Water makers, Refrigeration, Eskimo Ice machines are our game and Chilled Water systems for mega yachts is our specialty. 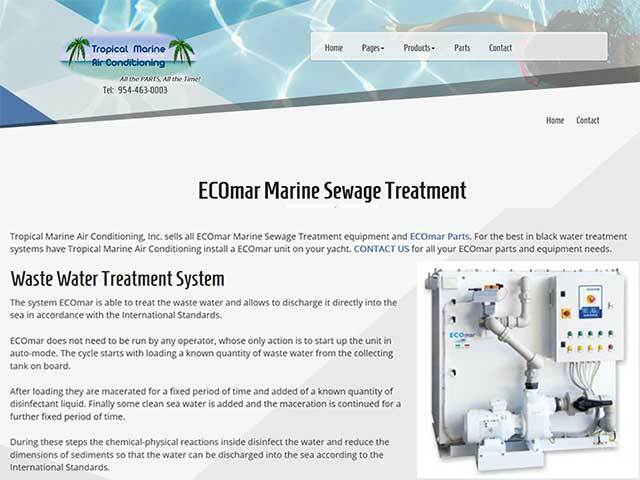 Tropical Marine services the tri-county area of Broward, Dade and Palm Beach counties for the cities of Fort Lauderdale, Miami and Palm Beach. We provide marine parts and equipment worldwide. Over 30 years of marine A/C, watermakers, refigerationa and ice machines and we’re keeping up with all the new stuff. 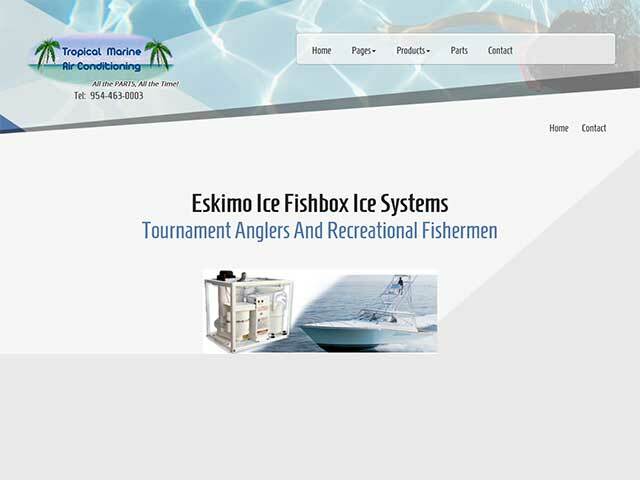 Tropical Marine Air Conditioning, Inc. services and sells marine equipment and parts- Marine Air, AquaAir, Technicold, and Cruisair air conditioning, refrigeration by U-Line, water makers SeaXchange and Spot Zero, ECOmar Sewage Treatment Systems, and ice machines from Eskimo Ice, and service for all other makes. 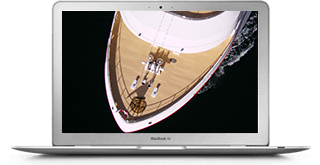 Dometic delivers marine air conditioning with Cruisair sytems and controls. 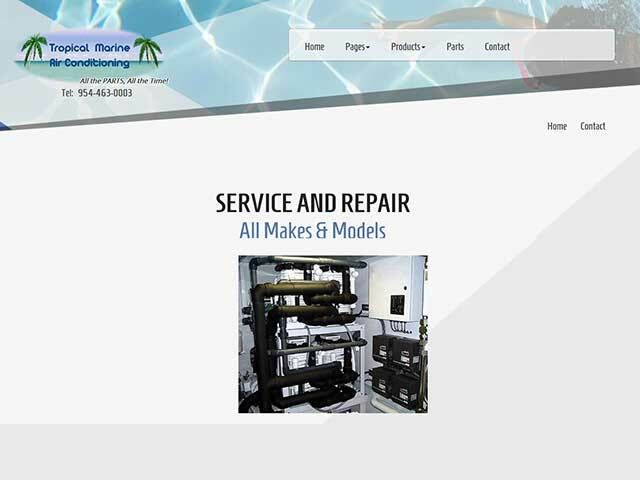 Tropical Marine Air Conditioning is an experienced Cruisair dealer for service and parts. Dometic SeaXchange water makers provide the best in reverse osmosis water suitable for all yacht sizes. 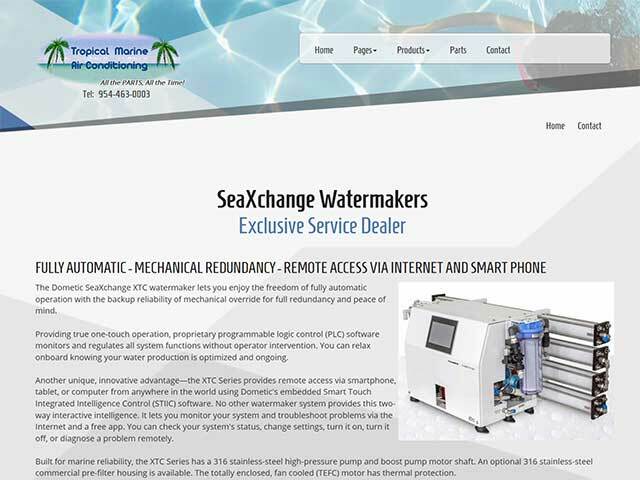 You can't go wrong with SeaXchange water makers on your boat. Dometic Spot Zero is both mobile and standard configurations for spot free water aboard yachts. 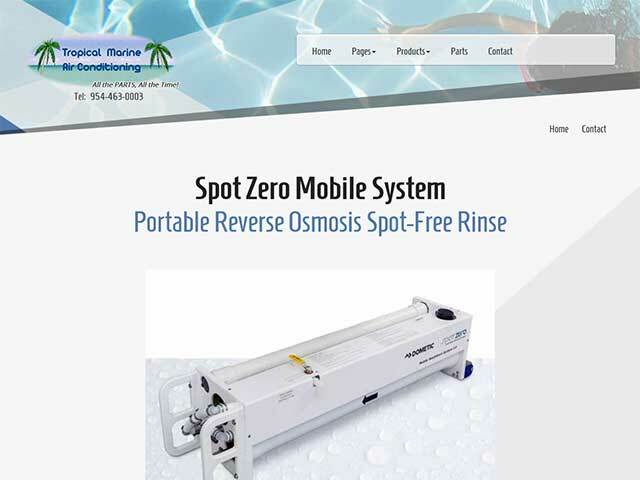 Double Pass system ensures high quality reverse osmosis water double treated. Dometic provides marine air conditioning with Marine Air sytems and controls. 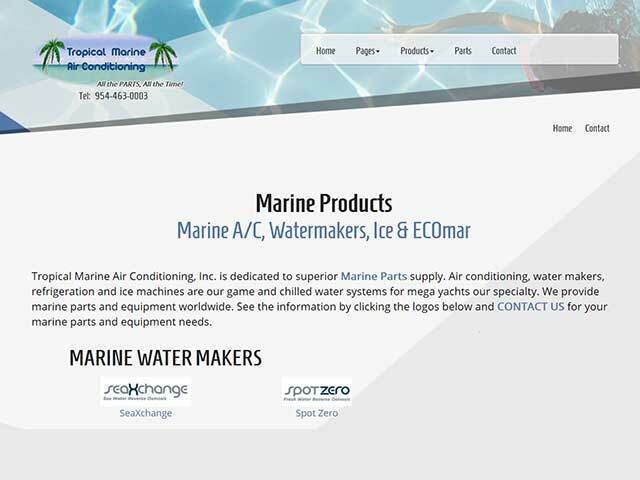 Tropical Marine Air Conditioning is an experienced Marine Air dealer for service and parts. 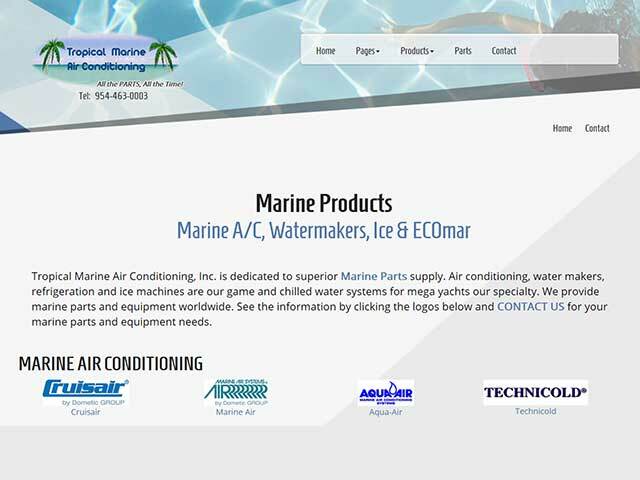 Tropical Marine Air Conditioning offers complete support. Get the best information from Tropical Marine. Find manuals and specifications on this web site to help you with new gear or repairs with our parts. Talk to us and get the low down on equipment, installations and repairs. Tropical Marine has All the Parts, All the Time! Whether air conditioning, water makers, refrigeration, ice makers or ECOmar sewage treatment has all the parts and supplies you need to keep equipent running. Rely on us for the parts and information to get it done right the first time. Sometimes you just need a little 'help' to get things just right! Don’t miss out on these awesome Services! New installations and repairs by trained service personel. Get installations aboard your yacht done right with Tropical Marine Air Conditioning. Our trained personel will install new equipment on time and on budget. Tropical Marine Air Conditioning knows a boat isn't a yacht unless air conditioning, ice makers, refrigeration, water makers and all the other things needed for yachting are in tip top working order. Call us for prompt service in the South Florida area. Click or tap a button below for the pages of our website grouped for easy viewing. Knowledgeable and extremely helpful for the parts we needed. Chiller project turned out awesome. Parts as exactly ordered and on time.